​PeopleHours software is used to monitor over 50,000 Security Officers for Book-On's,Book-Offs and Lone Worker Safety on a daily basis. The PeopleHours™ solution consists of a number of modular integrated application components, which automatically update in real-time. Schedule- Primary application which contains all employee and location data and the duty schedules for both. Work Monitor- Monitors the time and attendance of all staff as well as any check calls, incidents or third-party device messages and alarms. 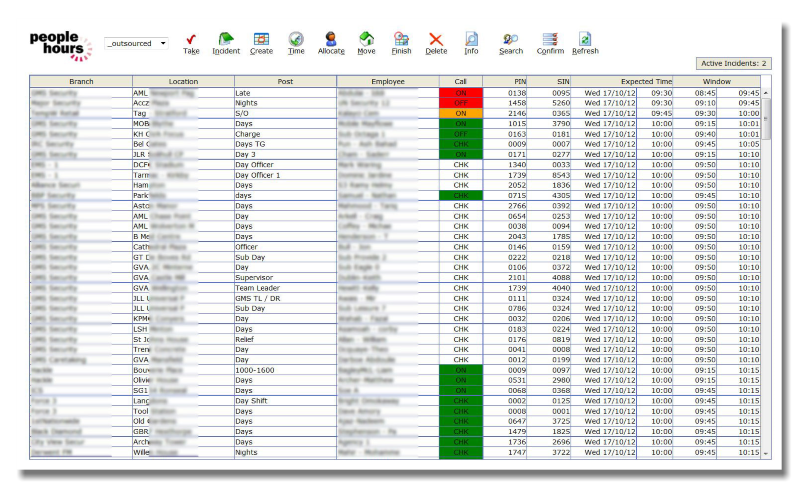 CallTakerIO Monitor- details all calls received from employees including any calls that were rejected or invalid. Administration- Controls most of the higher configuration for PeopleHours™. CallTakerIO- VoIP and Mobile App-based, allows employees to record their time and attendance, make scheduled welfare calls or leave operational messages. Mobile Work Monitor- A Mobile optimized version of the WorkMonitor application for use on Tablets and smartphones. TelMe- Android & Apple iOS based solution for guards & supervisory staff, complete with messaging options and employee portal. PeoplePatrol- Mobile and static patrol recording using Android devices and NFC tags together with a range of other Guard Tour Hardware. PeopleHours™ is the ideal solution for Guard Services organizations employing 100 -10,000 or more employees over multiple locations. All information is recorded and delivered to the cloud in real-time, allowing Managers and Supervisors to find out immediately if employees don't check in or show up at their posts. Use the web-based Work Monitor and Calltaker Monitor to monitor employee shift activity and immediately receive alerts for issues. Multiple Ways to "Clock In" or "Clock Out"
Depending on the software license purchased, employees can sign in and out of their shifts by either calling a predefined VOIP phone number, or using the TelMe Android app. ​PeopleHours™ is at its core a simple and effective way to create and manage a large workforce with supreme accuracy and the minimum of effort. Using PeopleHours™​ powerful "Check Call" functionality, prompt staff with automated phone calls or android messages to confirm they are active and OK. Be alerted when employees don't respond in a timely manner. ​PeopleHours™ is supplied as a hosted solution, or SaaS, Software as a Service, removing the hassle of installing, managing, and supporting it. We provide secure access over the internet to PeopleHours™ running on servers in our remote data centres. Our team of experienced experts look after the software, hardware, backups, security and user support for you—leaving you more time to manage your business and your customers. ​Users can access PeopleHours™ from any PC connected to the internet. They can work anywhere at anytime with quick and secure access over the internet. The result—greater productivity and convenience weather at the office or at home. Specific functionality also exists for smartphones and PDA’s allowing access in the field. An Enterprise-class solution without the price tag. ​Our managed hosting solution helps you keep costs under control. You avoid upfront hardware and software expenditure and ease the support and maintenance burden on your IT department. You only pay for what you use, keeping costs predictable and manageable. Customers no longer need to worry about upgrade headaches, we do them for you. The easy scalability offered by PeopleHours™ makes adding and supporting users effortless as your company grows. ​With our managed hosting service your data is protected within our data centres. Full user authentication sophisticated firewall technology and hourly database mirroring ensures data backup. Focus on business uptime not downtime and benefit from enterprise security protection. ​Time and Attendance - Monitor duration spent on site. Employees can view upcoming shift times and locations, Clock in/out from the software using the TelMe Mobile app or by calling a specialized VoIP phone number (contact us for details). Automated Welfare/Safety Checks - Perform regular automated checks on staff to ensure they are actively working and safe. Support for third-party systems - Export data to external Payroll and Billing systems, eliminating the need for timesheets or third-party calculations using applications like Excel. Secure your mobile devices from unauthorized and disallowed app usage (such as web surfing, gaming, and the Google Play Store). Prevent users from tampering with settings. Manage and monitor users with a variety of built-in tools such as GPS location tracking and independant Enterprise Store functionality. Facilitate multi-channel, multi-directional voice, text and media communications between team members using a true VoIP alternative to conventional Walkie-Talkie radios. Take advantage of additional features not seen in older 2-way radio systems such as dynamic channel creation, archived on-demand message history/playback, text-to-speech messaging and picture sending. Optional hardware compatibility with gateway devices for integration with your existing radios. Eliminate illegible and lost paperwork, bulky clipboards and maximize efficiency in a lone worker or team environment with this paperless solution for Android mobile phones and tablets. Submit paperless digital forms/inspections/checklists, assign work to be done, and obtain a record proving the location where the work was completed. Multi-function Facility Management Suite that leverages the power of mobile technology to substantially reduce paperwork and improve efficiencies for all field personnel.